Ever since this year’s algorithm change, small businesses have found it harder to market themselves on Facebook. Did you know that 60 million businesses have a Facebook page? With all those businesses tossing ads around, it’s no wonder the social media platform decided to make some feed adjustments. Does this mean that all hope is lost for your small to medium-sized business on Facebook? Of course not! Facebook has recently turned its attention towards groups, which means you have another opportunity to expand your social media marketing practices. The addition of new features and tools has been giving administrators plenty of options for expanding their communities, which means you can too. The cool thing about Facebook groups is that they give you space to personally engage with your customers and facilitate valuable discussion among members, which is what Facebook is all about these days. Groups also create a sense of security and safety, which means your followers may open up to you in ways they normally wouldn’t if they were posting publicly on your page. Facebook groups make excellent environments for discovering valuable feedback that can help improve your products and services. They also allow your members to talk about their shared interests and divulge valuable insights that can promote positive feelings about your brand. Considering over one billion of Facebook’s users are actively involved in groups, you’re better off to embrace the changes and create one now. If you’re unsure of where to start with your business Facebook group, here’s a list of tips that will help you get the ball rolling. In order for your Facebook group to be helpful for you and your followers, it has to have a purpose. When you know your group’s purpose, you then know the type of members you’re looking for and the kinds of interactions you want them to have. Do you want your group to operate like a community where like-minded customers can engage in enriching conversations about your industry? Would you prefer your group to be an open forum where members can pose questions? Maybe you’re hoping to create a group where customers can share feedback on their experiences with your services or products. 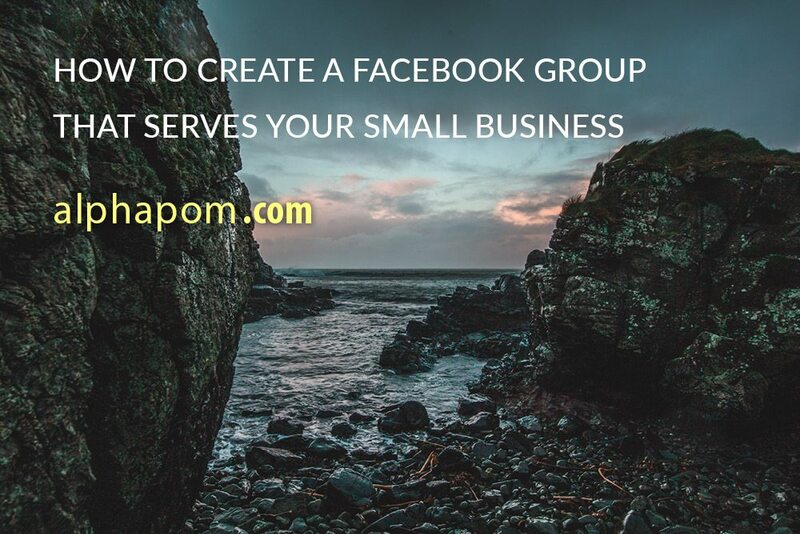 All of the above are legitimate reasons to start a Facebook group to grow your business. Once you have a clear vision of this, you’ll be able to grow it quickly. You have control over the kind of group you create and the best way to set the tone is to make it public, closed, or secret. Choosing one of these three options will help you create the kind of community you’re looking for. Be sure to then create and enforce a set of rules for your group. Public groups – These groups are easy to find and join, which can increase your membership numbers rapidly. Closed groups – Require approval, which means you can filter the members. When you create the right kind of community in your Facebook group, you should see a good amount of activity. However, the role of adding value to the group falls on you. In order to keep users active and encourage them to feel like part of your special community, you need to great and post original content. If you’re simply posting the same things to your group that you post on your Facebook page, then what’s the point of joining the group? Some ideas for original group content are blog posts, videos, live streams, images, and challenges. Do you need help building an effective social media marketing strategy? Alphapom is a locally owned and operated company that helps small businesses in the Cedar Rapids, Iowa City, and Marion areas. We love all thing SEO, online marketing, digital design, and video marketing. Give us a call today to discuss your social media marketing needs and we’ll chat.